I have a slight mango obsession. I’ve been stockpiling them. Every week I go to the market, I feel an urge to buy more — regardless of how many are left in our fridge. I must have had about 20 at some point last week. I’m just so excited that they’re both in season and affordable. So, I’ve been forced (oh, the pain) to find creative ways to go through them. A mango a day keeps the doctor away, no? 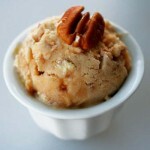 Fortunately, mangoes are very amenable to being used in ice cream — strong in flavor, not too watery. The buttermilk base here creates a wonderful texture — thick and creamy (and low fat! ), and soft even after a week in the freezer, the holy grail of homemade ice creams that shy away from heavy creams and egg yolks. Believe it or not, the fresh basil adds a great kick of flavor, as it does for many fruit-based desserts. Kind of like what I imagine licorice would taste like if licorice actually, like, tasted good (sorry, licorice lovers). Slice open the mangoes — to cut a mango, slice it lengthwise parallel to the flat side of the pit. 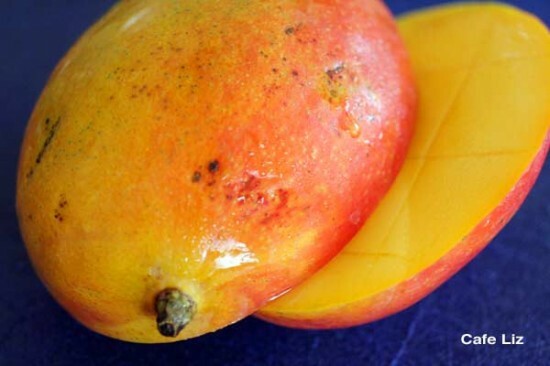 The mango itself tends to have two relatively flat sides, and that’s basically the shape the pit takes inside. To remove the flesh from the mango halves, score them with a knife to make a large grid (see above photo), flip the peel inside out and pull off the squares of flesh. Use a knife to cut off the flesh remaining around the pit as well. Put the mango in a blender with the other ingredients and blend until smooth. At this point you can either drink it like a milkshake, or freeze it in your ice cream maker according to the manufacturer’s instructions (app. 30 min, followed by hardening time in the freezer). 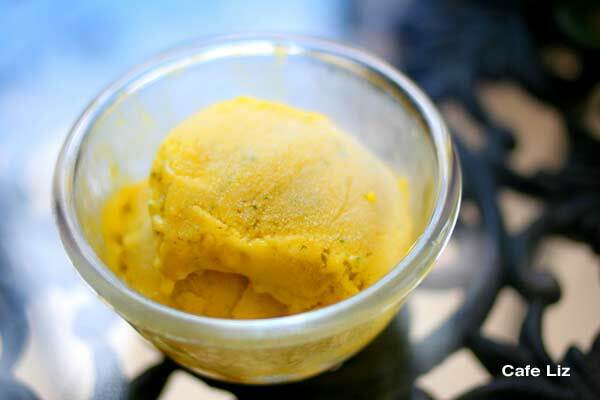 If you do the latter, you might note that some clumps of mango fibers are lumped around the blade of the ice cream maker at the end of the churning process — do yourself a favor and DO NOT mix them back into the ice cream. The texture will be be better as a result. 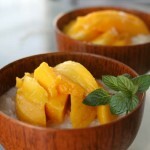 6 Responses to "Mango-basil frozen yogurt"
Oooh, looks wonderful. 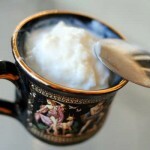 Wonder what that would be like using coconut milk as a base for a parev version? And I’d use goats’ milk yoghurt instead of buttermilk as my daughter is lactose intolerant. Thanks! Both sound like they’d make excellent alternatives. I share your obsession with mangoes, & right now we are trying to maximize our intake of mangoes, since summer is not going to last for ever! I love mangos, especially with bright herbs like basil – I bet cilantro or mint would be great too. The buttermilk base sounds like a fantastic way to make ice cream!